How do you know your website gets the job done? Do you get emails or comments from viewers? Did your mom say it looks great? No disrespect to mom, but without a reporting tool like Google Analytics, measuring the success of a website is dodgy at best. 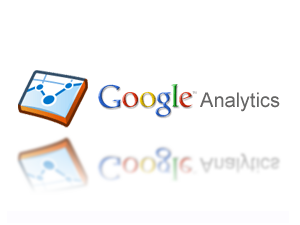 Google Analytics offers free reporting and metric tools for just about any website. Reviewing metrics on a weekly or monthly basis informs you as to how much traffic you’re getting and where traffic comes from. Properly analyzing website metrics can help you focus on content that viewers enjoy. It also helps you understand what’s not working, so you can make adjustments. Even if the sight of a pie chart makes you queasy, Google Analytics makes things simple enough that you can interpret the data in meaningful ways. This isn’t a reenactment of grade school horror stories. All you need is a Google account and a website; we can guide you from there. After creating a Google account, you will need to add your website to your account. From the Google Analytics Home screen, simply click on the Admin button in the top toolbar and select “+ New Account.” From there the instructions are straightforward. One of the last steps asks you to add a Tracking ID to your website. The tracking ID acts like a tracking beacon, telling Google Analytics what to keep an eye on. Google offers step-by-step instructions to install tracking code on your website. If you’re worrying about reading code, relax. Thankfully, you just need to copy/paste the code, and don’t stress the details too much. If you read our prior post, “Easy Traffic-Building Tips for Your Website,” you might remember that planning should be one of your top priorities. Well, Google Analytics lets you not only make goals, but track them as well. While within the Admin tool, click on your website in the account listings. Keep clicking on the website until you get to the Profiles page. Here, Google created a Goals tab. There are four preset goal types: URL Destination, Visit Duration, Page/Visit and Event. Going back to our traffic-building tips blog, creating goals can help keep you accountable, especially when Google sends you reports. This physical evidence will hopefully give you extra motivation to move past planning and focus on persistent content strategies to achieve your goals. Google Analytics offers many, many ways to view and collate metrics. 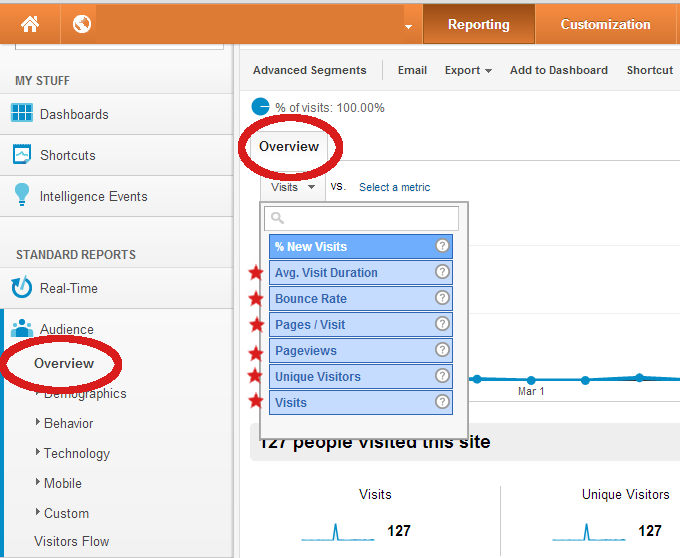 While logged in to the Analytics site, you can use preset reporting tools using the Reporting tab. As an introduction to Google Analytics, we’ll focus on standard reporting tools, but the truly ambitious can create custom reports under the Customization tab in the toolbar atop the Analytics page. The Overview tab in the left sidebar offers plenty of information to dive into. From Overview, you can select what kind of data you want to focus on. A drop-down tab (see image above) lets you select your analytic filters. For explanations of each filter, simply roll your mouse over the question mark icon. To print or save reports on your computer, simply click the Export drop-down, and you’re home free. We told you it was simple! If you don’t care for printing reports from, say, Microsoft Excel or Google Spreadsheets, you can add your favorite metrics to a dashboard. While viewing a particular metric, click “Add to Dashboard” and follow Google’s lead from there. While every website is different, some baseline goals might help you start your journey measuring metrics and goals. For instance, bounce rate measures how many people leave your from the Home page. According to Inc.com, a 50% bounce rate is average, so don’t let that get you down. Visit duration should be another important metric to watch, as it measures how long visitors stay under the warmth of your website’s glowing radiance. A one-minute duration should be an achievable goal for new websites. But, this number shows how engaged your visitors are with content, so the higher the better. A three minute duration, for example, is excellent. Now that you know the basics of Google Analytics, we hope that you’re at least motivated enough to set up Google Analytics and boost your site’s performance beyond what you’ve seen in this post’s screenshots. That guy can really use some help!